Tomorrow, November 26, the gallery in Shirokane will be closed due to ongoing photography. We apologize for the inconvenience. 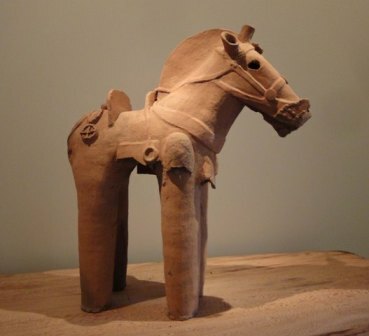 London Gallery in the Shriokane Art Complex will be opening a new exhibition, this time including a large haniwa horse (Kofun Period, 6th century, h.97cm). There will be an opening reception on Saturday November 19, together with the Kodama Gallery on the 1st floor, NANZUKA UNDERGROUND on the 2nd floor, and Yamamoto Gendai on the 3rd floor. "Tokyo Art Month" (see link above) will begin from 6:00pm (Sponsored by Tokyo Metro). London Gallery will be serving wine provided by the Asahi Brewing Corporation on the 4th floor. We hope this finds you well, as the weather has suddenly turned toward winter chills. The current Mishōtai exhibition, which has drawn a great many questions from visitors, finishes on Thursday November 17. To allow for rotating the objects and setting up the next show, the gallery in Shirokane will also be closed of Friday November 18.